Sometimes a reader just has to ask "does the sentient dinosaur boy actually add anything to the story?" 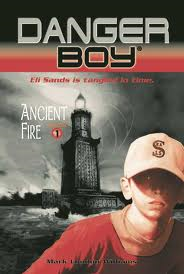 In the case of Ancient Fire (Danger Boy, book 1), by Mark London Williams (2001), I'm happy to say that he does. But before we meet this particular sentient dinosaur from an alternate reality, a lot of other things have to happen. It is 2019. Physics has advanced, to the point that two scientists, husband and wife, have made a breakthrough that may allow time travel to be a workable proposition. A secret government agency is very interested indeed in the ramifications of this...and its agents have invaded the lab where the research is being carried out, and are pushing the experiments to dangerous levels. So much so that the female scientist disappears, as it were, in a puff of (metaphoric) time smoke. Her husband, desperate to escape from government control, flees across country with their son, Eli, but the government agents track them, and force the work to continue. And when Eli incautiously interferes with an experiment, he becomes unlocked in time himself! In the meantime, a young saurian lad is headed out on a mission to an alternate earth, because this is what all young saurians do in middle school. The physics of his journey collides with Eli's first rush through time, and they find themselves in ancient Alexandria, just in time to be attacked by an angry mob. There they meet Thea, daughter of Hypatia, librarian of Alexandria. After some bouncing in time/near death at the hands of angry mob/manipulation by government agents/the revelation that Eli's mom might be alive in the 1930s/a plague that might have been brought from the past/an angry rhino, the book ends....with lots more story left to be told! Basically, the sentient dinosaur boy, Clyne, made the book for me. Without him, it would be generic science-driven time travel for the young; with him, there's lovely cross-cultural exploration, with bonus surrealism. He's the most engaging character, qua character, as well--perhaps because Eli and Thea are both in such unhappy and anxious states that they don't add much lightness to story (Clyne's major worry, until he's in mortal peril himself, is the grade he's going get), but mostly because he's such a pleasant, inquisitive, optimistic sentient dinosaur that I liked him lots. The book also offers a nice introduction to the burning of the Great Library of Alexandria, for those anxious to learn about the past (harrowing, though, to watch the scrolls go up in smoke), and for those who are physics geeks, doubtless the science of nanoparticles and the nature of time and space will provide interesting fodder for critical thought. (The only other sentient saurian character I can think of is the one in Sherri Tepper's Gibbon's Decline and Fall, which I've whited out the title of because it is a spoiler. And I didn't mind it there either, so maybe I am more open-minded viz dinosaurs than I think I am. I still have no desire to read Anne McCaffery's Dinosaur Planet books though). This might be my favorite review opener ever! And maybe I'll see if it would be good for my boy. I maybe did try a Dinosaur Planet book in my youth, and if I'm right, you are wise to stay away from them. I liked writing that sentence very much! Dinotopia hit its peak when I was in college, and I remember regretting that I hadn't had it when I was younger! Hey! I was doing some research on my own books, when I came across this kind review! Thanks! I'm actually writing a scene with that exact same sentient Saurian right now -- for a Danger Boy "novella" set to be released at the end of the year.